While it may feel easy to be in a continuous state of go-go-go all the time, because it’s your routine and what feels “normal,” long term you may be at risk for adrenal fatigue or burn out. Carving time daily for self-care is the single most important thing you can do for your overall health! By lowering the stress hormone, cortisol, from being constantly elevated you lower your risk of developing a chronic disease. Taking care of YOU – turns you into a stronger person, which allows you to hold space and support your loved ones and the people that matter in your life. Self-care can take various forms. It doesn’t have to be fancy or costly. The best self-care is what feels best to you! Accept that your physical body cannot continue to function optimally long term without backup support from your mental health. Interestingly, you can re-wire your brain chemistry and nervous system to alter how you feel in your physical body giving you more energy, strength and balance. For example, taking 10 minutes to lie horizontal and in complete stillness (or in meditation) while focusing on your breathing, creates chemical signals that tell your nervous system that everything in your surroundings is safe. Cortisol protects us during moments of high anxiety or when the demands of life feel overwhelming. Tune in to your physical body and recognize when you notice: weight gain around your abdomen, high blood pressure, reduced ability to fight infection or sugar cravings. These occur, as a result of high cortisol and are the first signs to start initiating regular self-care. Women wear many hats and take on varying roles: mom, wife, partner, friend, provider, nurturer, manager, director, and entrepreneur to name a few. There’s an expectation to be perfect and a miss-conception that asking for help is a sign of weakness and failure. But once you allow your feelings of shame and guilt to take a back seat and take a stand for YOU, allow yourself to be heard, be vulnerable, and say “no” to commitments that cause overwhelm, you begin the real self-healing journey. And that not only shows incredible strength and courage but also allows you to shine as a role model for others in your life! Leadership is about modeling self-regulation, self-accountability and self-confidence in a way that will create influential future leaders. Parents have the most empowering leadership responsibility, shaping future generations that are going to create massive change in our world – wow! Children depend on their parents to teach and show them the way. The most selfless thing you can do for your children is to put energy into your physical and mental health so you can be fully present, engaged and the best version of yourself around them. With the rising number of childhood anxiety cases teaching your children about self-care will create the foundation for not only their health but for success as they grow and as the demands of life amplify. If you imagine your life 6 months from now how would you like to feel? What do you want to be doing? What do you want to see change in your life? Answering these questions may be tough. Or maybe you aren’t sure, or just don’t want to say the answers because the thought of them actually happening feels impossible right now. I am here to tell you that you truly can aspire to be who ever you want to be and feeling calm, clear from hustle and confident in your mental and physical health is in your future! I have helped many women transition from stressed to blessed in their lives and my biggest passion is that you feel empowered to live as the best version of yourself! This is one of my favourite self-care appointments to have. The feeling of relaxation once those needles go in, nestled under a sheet with heat over my body is just heavenly. Through the principles of traditional Chinese medicine, including a whole body approach to treatment, acupuncture is not only relaxing but also rejuvenating! This month – I challenge you to add one self-care or self- love practice into your daily life. Future you thanks you in advance! 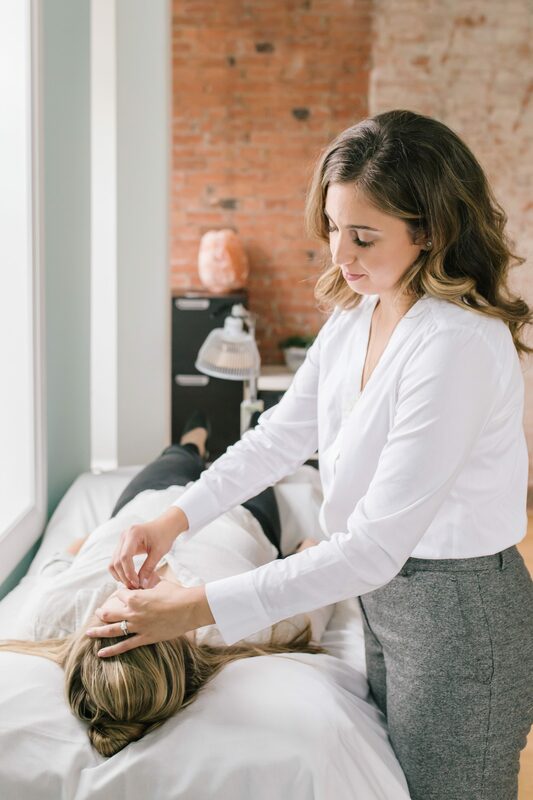 Dr. Antoinette Falco is a Guelph-based Naturopathic Doctor and birth doula with a special interest in helping women overcomes hormone imbalances so they can live and feel like the best versions of themselves! To find out if Dr. Antoinette’s approach to helping women optimise their hormone health is right for you, book a Hormone Discovery Meet and Greet or call 519 265 6963 with any questions you may have.